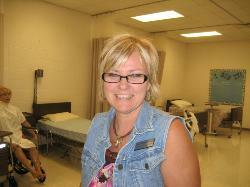 Health Occupations is a one year exploratory class for seniors. 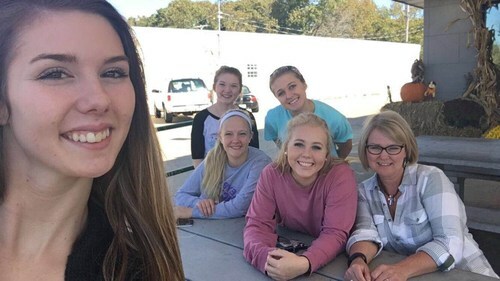 One of the program goals is to help each student examine their own personality and abilities and to find the health career that they would find most rewarding. 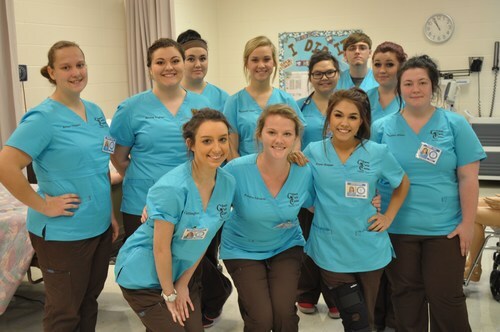 Students use the knowledge gained in this class to go immediately to work as a health care assistant or to acquire admission and success in a more advanced health career program. The opportunity for senior students who meet specific requirements to take the exam for Missouri Certification for Nurse Assistants. 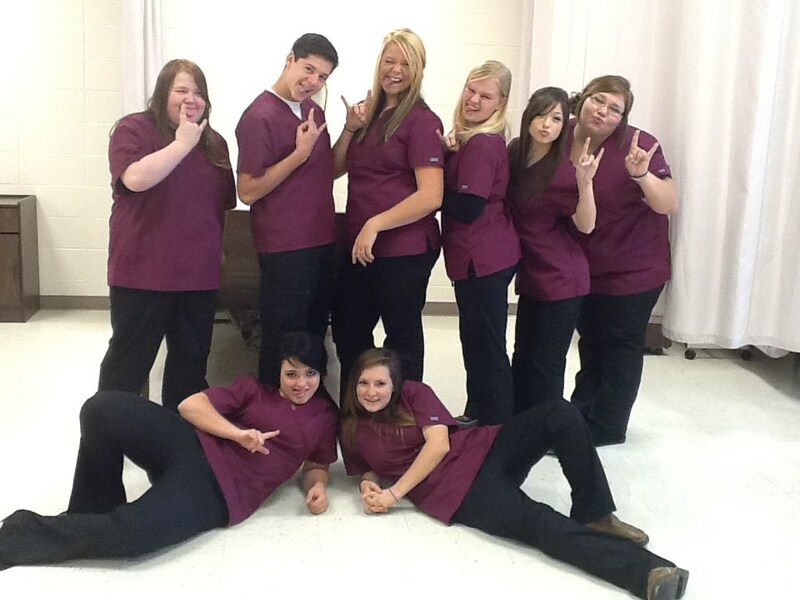 The Health Tech students are getting excited to do nurse assistant skills in the lab. We have been very busy in the classroom so far this semester learning about health care systems, health care trends, and many different careers. We have recently been studying about professionalism, both appearance and characteristics. Today we began to learn about another component of professionalism, communication. They practiced communication when barriers come in to play such as music playing in the background, oxygen concentrator running, difficulty hearing (cotton in their ears), and cataracts causing poor vision (vaseline on the sunglasses). It was a very eye opening experience to realize how difficult distractions can make communication, not to mention the difficulty of getting an accurate blood pressure. TB testing outing today! Getting checklist done for clinical observations and on the job training. We got our class shirts!! We got our class shirts!!! The first day at the nursing home was great! The students were allowed to explore the facility by participating in a scavenger hunt. 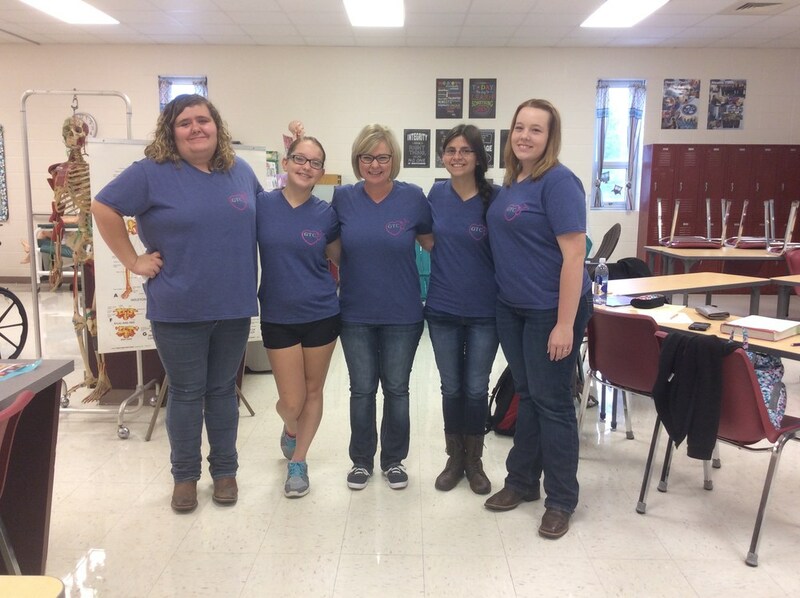 During this hunt they had to find things such as equipment and special rooms, but they also had to introduce themselves to the Administrator and the Director of Nursing. Thanks to Table Rock Health Care for allowing students to put to practice their CNA skills another year. 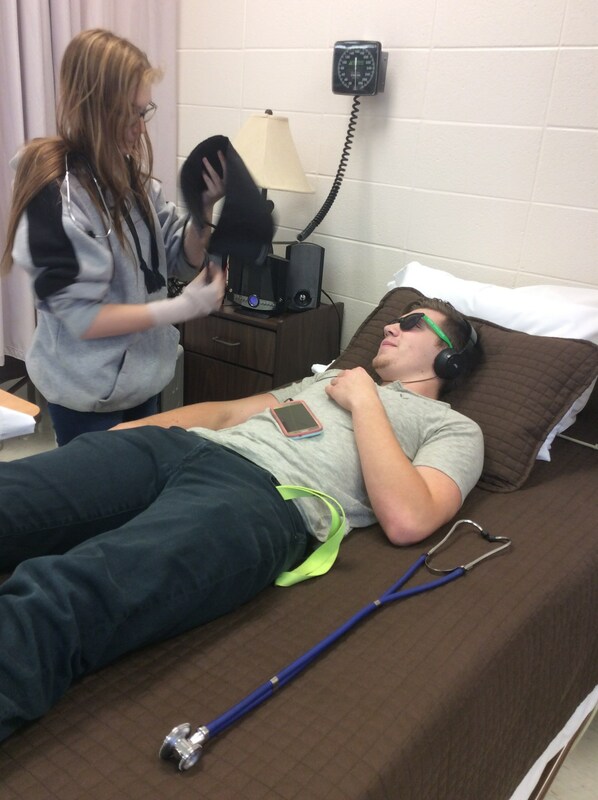 Performing the bed shampoo skill is always a fun day in Health Tech. This year was no different. They worked hard and mastered yet another skill!! We started the new year off really busy mastering the list of CNA skills before time to start their on the job training at the nursing home. Kendra is checking off on dressing Angel. Second day of clinic observations and another great experience for each of them!! 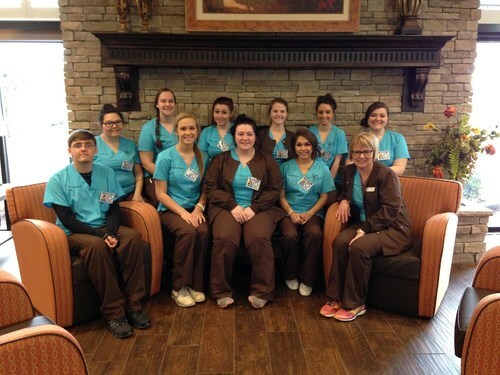 We began our local clinical rotation yesterday, November. Everyone was excited to get into the clinics and observe various health care professionals. The first day was a success as the students all had a positive experience. 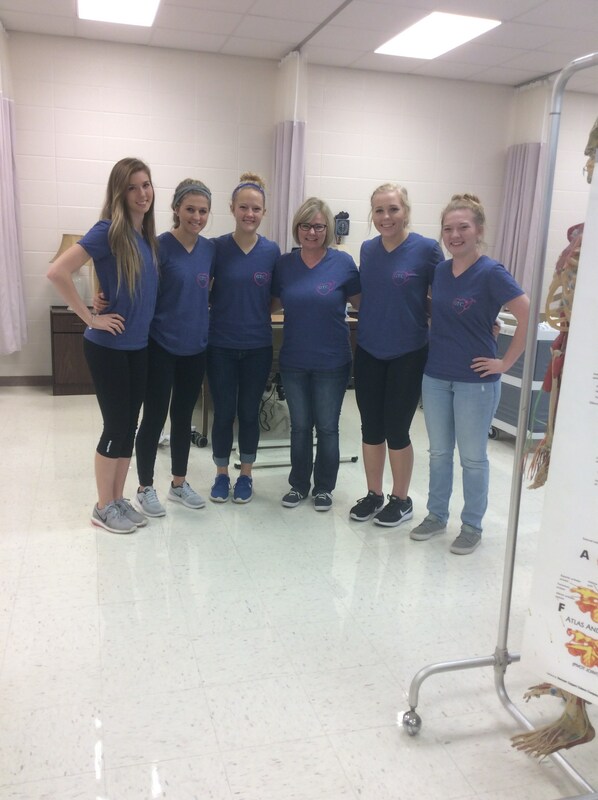 We will continue with clinic rotation every Monday and Tuesday through December 15th while working hard in the lab Wednesday through Friday each week to learn skills and prepare for the nursing home rotation to start in February. 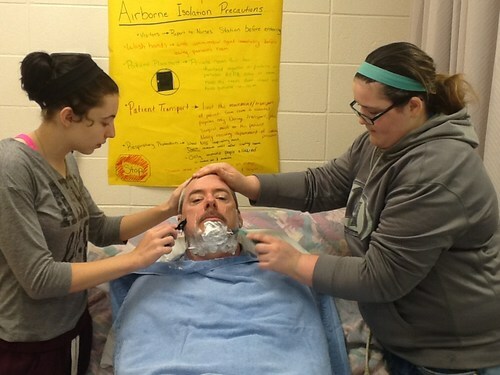 Mr. Thompson was brave enough to allow the Health Tech students to shave him. The other students shaved boys from other GTC classes that volunteered. 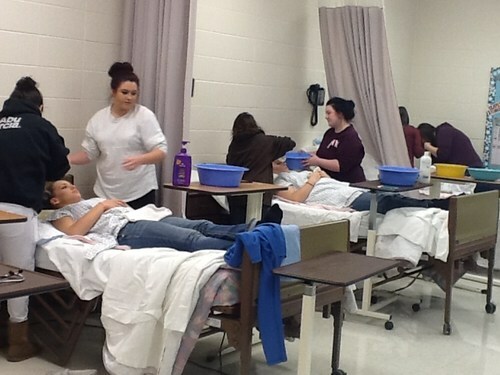 Students are working hard to get ready for their on the job training months at the nursing home. Health Tech has been very busy in January mastering all of the necessary skills to be ready for their on the job training at the nursing home by the end of the month. They have been practicing dressing their "resident" as you see in this picture of Jordan having dressed her resident, Jessika. 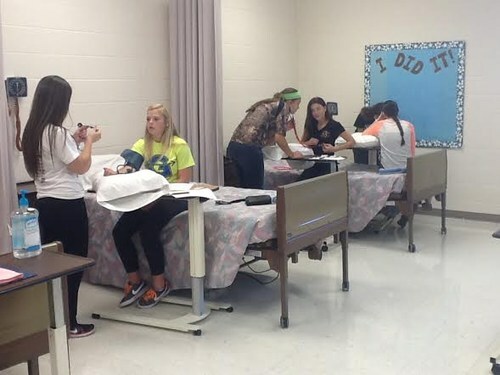 Health Tech students have been really busy hitting the books gaining all of the background knowledge to care for patients in a health care setting. They have learned a few skills along the way such as vital signs and infection control practices. They have been working to check off on these skills in the lab prior to our clinic observations in December. Health Tech has started out moving fast. 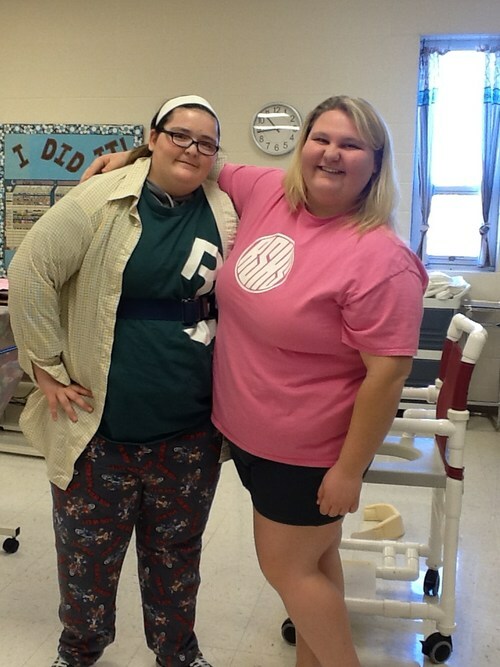 We have just made it through Chapters one and two from our Diversified Health Occupations Textbook. Did I mention...yes!! We have brand new 2014 textbooks. It is awesome to know that our students are learning from the most up to date materials in health care. The students will have their first chapter test on Thursday this week. We are fast approaching time for the CNA testing. I have set the dates for testing as 5/5/14-5/7/14. 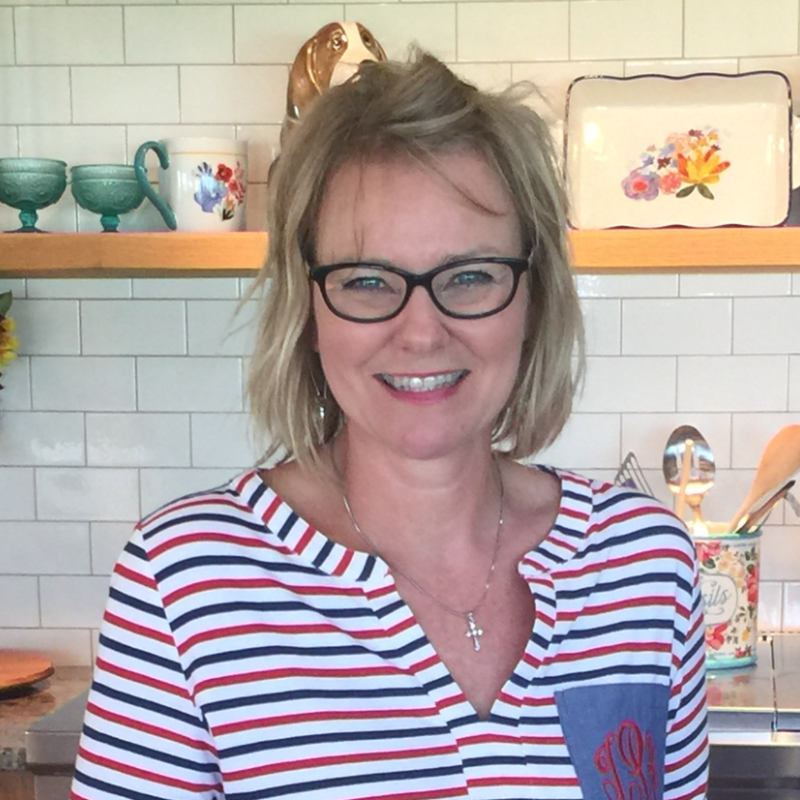 I have created a 16 day study plan to follow for studying and preparing to be successful on the CNA test. Attached is a copy of the file and I will also give the students a copy in class. 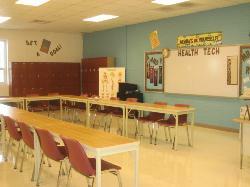 Today was picture day for the Health Tech class. Of course after the serious shots, they had to be silly. It was fun! !